There is a period in most people’s lives where we are surrounded by peers of the same age range. We get judged by those peers and we judge ourselves against those peers. We got a lot of instant feedback on what was and wasn’t socially acceptable. Those were our teenage years–jr. high and high school. Many of us were able to live life beyond that experience. We graduated high school and were able to come to know ourselves as individuals better. We were not so strongly influenced by peers. The world is very different now than it was when I graduated from high school. When I graduated, not even Myspace existed. Really! When I graduated, 99% of people my age did not have their own cell phone. We sometimes got to take a parent’s cell phone out with us. I moved to college and had to wait three days before I could call home because it took the phone company that long to set up our line (but we did have email–at school. We didn’t have internet connection at the apartment because, no phone! Back then, the internet was dial up for the average person). Now we live in a world where we are able to be constantly connected with people. We share our lives on Facebook, Instagram, Snapchat, YouTube, blogs…all the while, our choice are being “liked” and commented on. Judged. And we judge our own lives against the people we see on these same sites and apps. Because of this constant connectedness, we see behavior from adults that we used to see only from teenagers. Opinions passed off as fact and the only acceptable way to think are posted rampantly. People feel the need to make their judgments of the actions of other people very well known. Now, more than ever, we need to understand self-worth. I am not talking about self-concept or self-esteem. I am talking about self-worth. Self-esteem is your confidence in your won worth and ability. Self-respect. What you believe to be true about you. 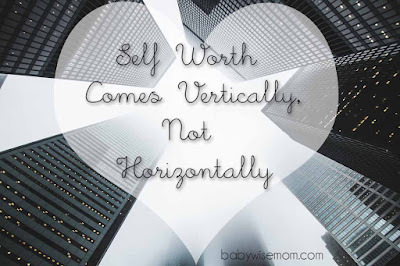 While self-worth is often used as a synonym for self-esteem, I propose that it is different. Your self-esteem can vary. It can change based on life experience. It can vary based on how many likes or page views you get. It can drop or rise with comments from friends and strangers. Self-worth never changes. Your worth is the same no matter how many likes you get or don’t get. It is not impacted by the comments people sling your way. It isn’t even impacted by your own opinion of yourself. Your worth is the same always. Your worth doesn’t come horizontally from peers–in person or e-person. Your worth just is. It comes vertically. Your worth is infinite. Your worth comes from above. Once you understand that, your self-esteem naturally follows. Your self-esteem becomes accurate and is not impacted by the ebbs and flows of the horizontal world. You are then able to pass that confidence and knowledge on to your children. You learn to love yourself on a pure level and you can teach your children to do the same. You can be an example of finding a true source for a measuring stick rather than what the social world thinks of us. We used to be able to escape that constant judgement at some point in life, but that time is past. We can lament the days of yore, but that doesn’t change what today’s reality is. We have to learn to adapt to reality. 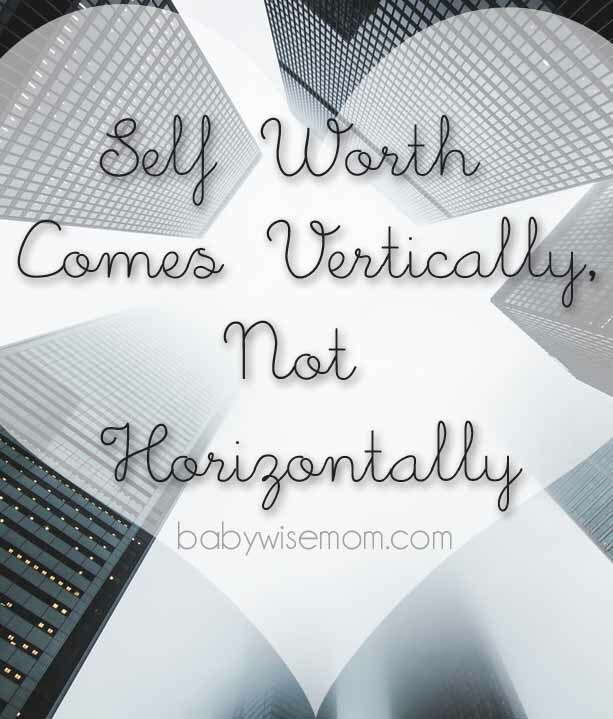 Love yourself, and love yourself the way you should–vertically. Today the ladies of the BFBN are posting under the topic of Love. Be sure to visit their blogs for discussions like loving your kids, loving your season, and what love means as a parent.